That sure took quite a bit of time, a few weeks back, Facebook introduced an update to its Facebook app for iOS, which brought Chat Head and Stickers to the messaging service within the app. 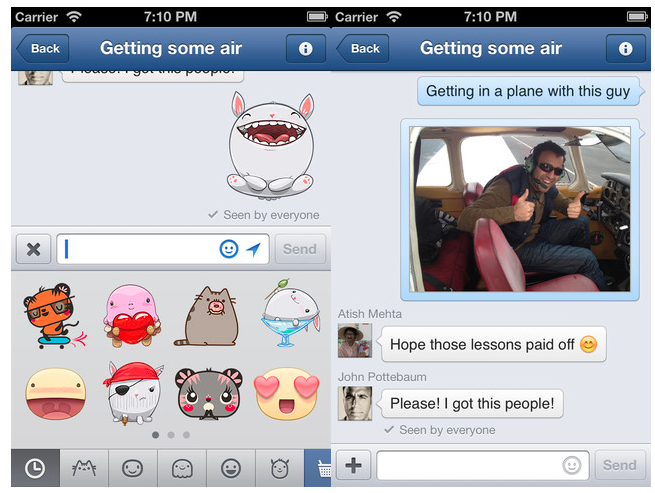 Today, the social networking website finally brought the Stickers update to its dedicated Messenger app for iOS. Apart from having extra large emoticons known as Stickers, that has a whole lot more expressions than traditional emoticons, the update also enabled a new “swipe to delete” ability. As for things over at Google, it looks like the Gmail app for iOS also received an update that pulls together other Google apps for iOS such as Chrome, YouTube and Google Maps. When users click into a URL, YouTube or Maps link, the app will automatically open the respective Google apps. If you would rather use Safari or Apple Maps, you can easily turn off the feature via the in-app settings page. Finally, Google also updated its Google Drive desktop app, bringing the ability to see share our Google Drive files directly from your desktop. It’s nothing major, it’s a feature that other cloud storage service like Dropbox already has, but it’s good to know that it’s finally available on Google Drive desktop app. Visit the respective app stores to perform the update now – Facebook Messenger, Gmail and Google Drive for Desktop.